The reverse of this coin is a modernised design of the 2015 commemorative £1 coin, created by Timothy Noad. The acclaimed artist has a background steeped in calligraphy, heraldry and illumination and specialises in working with age-old traditions and materials. As a Herald Painter (heraldic artist) at Her Majesty’s College of Arms, and Scribe and Illuminator to Her Majesty’s Crown Office at the House of Lords, Timothy Noad receives multiple commissions each year which incorporate the Royal Coat of Arms device in its traditional form. This design is especially important and meaningful to the artist as he had always harboured an ambition to create his own interpretation of the Royal Coat of Arms. Seizing his chance, he looked to the Hanoverian and Victorian periods for inspiration, and it was on a visit to the Royal Maritime Museum in Greenwich that he spotted an unusual variant. On the side of a naval drum dating from Nelson’s time was a Royal Coat of Arms giving the supporters (the lion and unicorn) much more prominence than usual – a design he thought would work well on something as small as a coin. 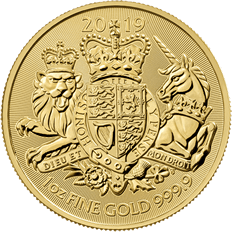 The Royal Arms gold bullion coin is struck in 999.9 fine gold. 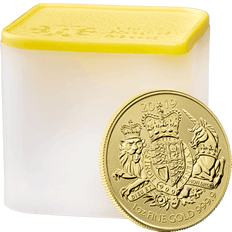 The gold bullion coin benefits from capital gains tax exemption for UK individuals and is VAT free for non-VAT registered individuals.